The consumer mindset is undergoing a massive shift - and today’s chart proves it. Over the past five years, real median household income growth has struggled to reach positive territory. And as a result, working-class consumers are dramatically changing their spending habits. To track this trend, we created a proprietary index of discount stores. We call it the Working-Class Index. It includes Dollar General (NYSE: DG), Dollar Tree (Nasdaq: DLTR), Big Lots (NYSE: BIG), Five Below (Nasdaq: FIVE) and Dollarama (TSX: DOL). 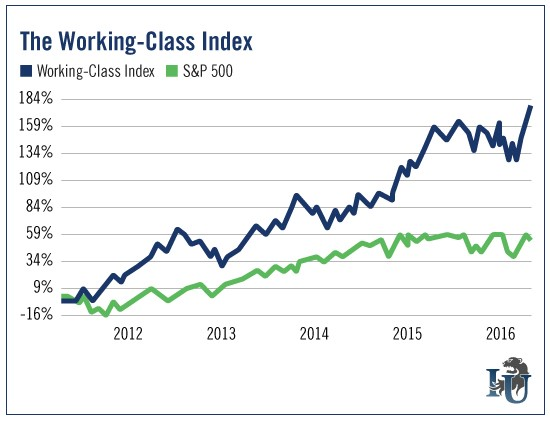 As you can see from our chart, over the last five years, the Working-Class Index has greatly outperformed the broader market. While the S&P 500 has gained 53%, the index has gained 180%. It's a trend that Alexander Green has been playing from the beginning. In fact, his Oxford Communiqué subscribers are currently sitting on a 89.9% gain on TJX Companies (NYSE: TJX) - the owner of discount retailers T.J. Maxx, Marshalls and HomeGoods. There is a major power shift occurring in the world of retail. Consumers are voting with their feet - and migrating from department stores to off-price retailers. In this economy, consumers are showing they'd rather have discounted prices than the more luxurious department store experience. The trend here is very clear. As tax returns begin to make their way into bank accounts nationwide, the Working-Class Index should reap the benefits of increased spending. P.S. We are mere hours from the deadline to submit your income tax return. Odds are, you already filed yours. But either way, there's still time to claim a special government-mandated "cash rebate." The only requirement is that you spent money and paid taxes on those expenses in 2015. To get a full rundown on how this rebate works - and the Congressional act that spawned it - click here.